Antiquing can be exhilarating. It’s the thrill of the hunt … to be surprised to find something unexpected and exclaim, “I can’t believe this is still sitting here!” Such was my reaction recently when I found a very reasonably priced antique tobacco basket. My husband didn’t understand my attraction, but I was head-over-heels to score the well-worn agricultural piece. 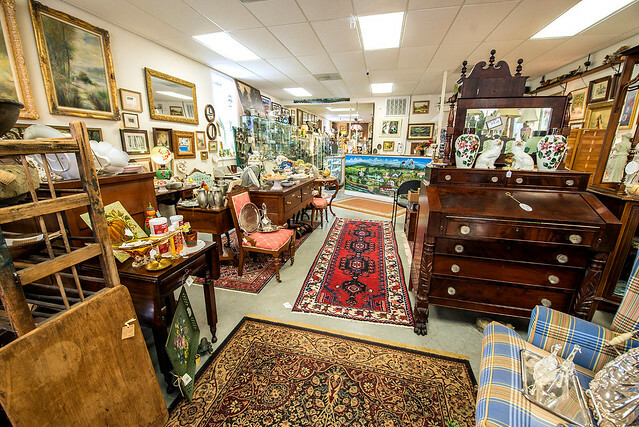 If you love stumbling upon a gem in the rough, or if there’s a long-sought treasure you’ve yet to uncover, consider these 10 spots for antique shopping in Virginia’s Blue Ridge. You’re welcome. A visit to the Antiques & Collectibles of The Crooked Road in Rocky Mount includes rows of vendors offering fine antiques and treasured pieces from farms and estates of Virginia’s Blue Ridge and Southwest Virginia. It&apos;s also the perfect spot to pick up some moonshine memorabilia - a necessary purchase when you&apos;re visiting the Moonshine Capital of the World. The windows of downtown Salem’s Antiques by the Market Antique Mall are inviting with a nice range of vintage and Victorian finds. And indeed, there are antiques by the market … the farmers market just across the street. 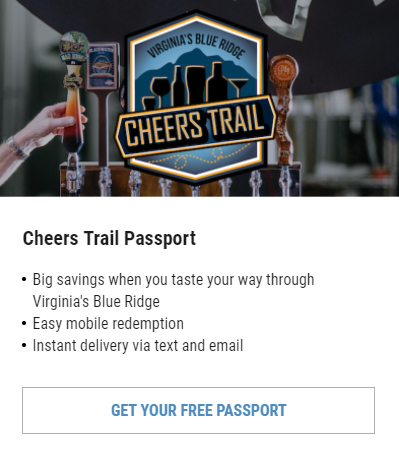 It’s local, local, and more local to love! Old tins, vintage advertisements, primitive finds and furnishings, and glassware are the most prominent offerings of the 50+ vendors at Charlotte’s Web. In outdoor booths you’ll find salvaged building supplies, fixtures, patio furnishings, and larger, unexpected items. Those entering Roanoke from the north via Route 11 quickly recognize Gene’s Trading Post for the large pieces out front. The white-columned building with grand pendant porch lighting bares a sign touting Tiffany Lamps within its 5,000 square-foot space. Finer vintage items like rugs, jewelry, and clocks are right at home at Gene’s, though they may be right at home in your home, too. 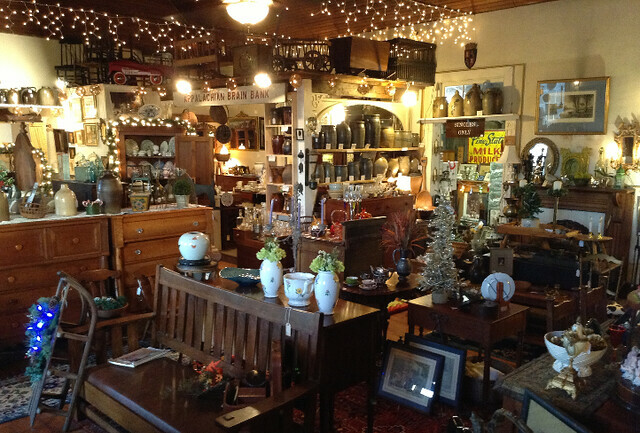 Primitives, vintage advertising, and nice 18th and 19th century art and furniture can be found at Harris Hall of Antiques. Hutches, corner cabinets, benches, ladder back chairs, and buffets are all par for the course. Those seeking art will find both original works and reproductions at Harris Hall. Glassware, lamps, jewelry, kitchenware, baskets, art, vintage toys, and more can be found on Main Street in Buchanan at Purgatory Emporium. It’s also a great place to pick up locally-made products like jams, jellies, and lotions. More than 120 deals spread across 24,000 square feet have stocked their best antique finds, including colored glass, vintage t-shirts, desks, clocks, milk bottles, clothing, books, and much, much more. You can easily spend a few hours perusing these booths. More than 40,000 square feet of interesting finds are on hand (and changing daily) at Black Dog Salvage, the real shop for TV’s Salvage Dawgs. Reimagined and reinvented pieces share space with “Marketplace” vendors to give you a wide range of shopping to experience. Seasonal home décor is found alongside carefully curated antiques and refinished furnishings at Buy the Season. Cupboards, beds, patio furniture, drop-leaf dining tables, and other antique pieces will undoubtedly force your hand to take something home. Not only will you find plenty of eye candy at Blue Ridge Antique Center, but you’ll also be treated to original handmade furnishings and reproductions by West Virginia artisan Tom Seely. Shop row upon row of ever-changing booths to find something “new” for you. 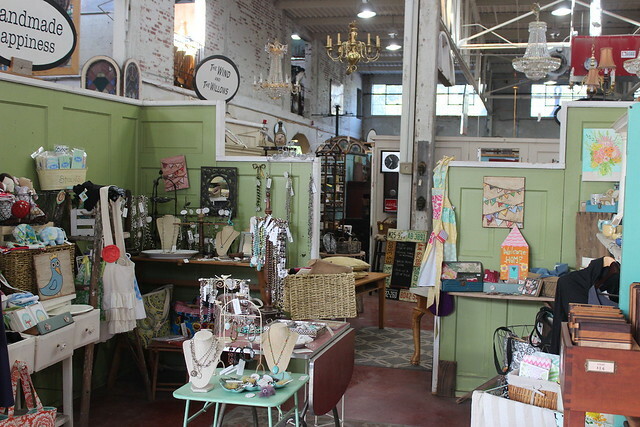 Want more antique shopping options? Good, because we didn’t even scrape the surface. 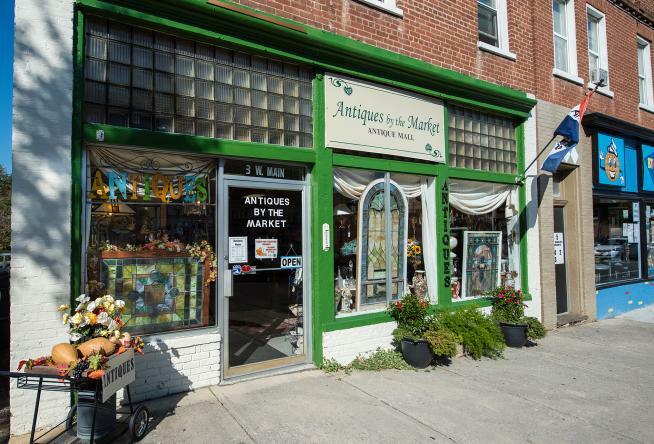 Find more shops and malls at Antique Shopping in Virginia’s Blue Ridge.